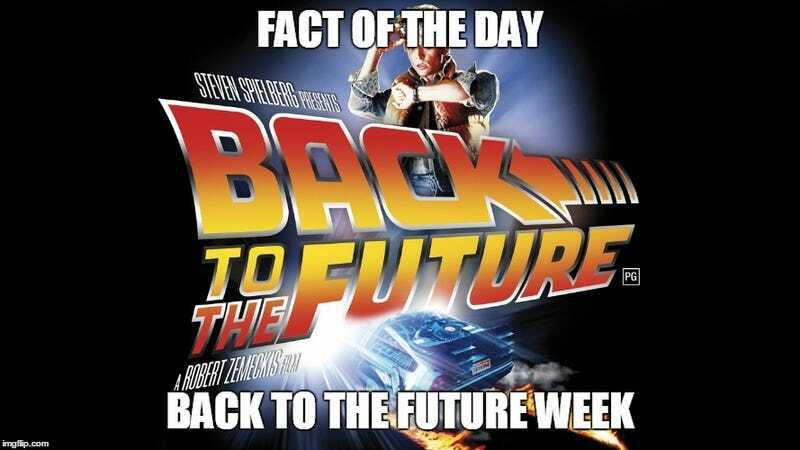 Fact Of The Day - Back To The Future Day Edition. We’re continuing Back To The Future week. Great Scott, I forgot Tuesday! Man this is heavy. I better make up for it today or else the rest of O-Deck will tell me to make like a tree and get out of here. Well today is the big day, Back To The Future day. Because apparently we can make a holiday out of anything. This is the day Marty McFly arrives in Hill Valley from the year 1985. And to commemorate such a momentous occasion, here are three facts about the making of the movies. Fact #1 Christopher Lloyd was cast after first choice John Lithgow became unavailable. From the Wiki That Is Powered By A Lighting Bolt With The Power Of 1.88 Jigawatts. Christopher Lloyd was cast as Doc Brown after the first choice, John Lithgow, became unavailable. Here is an interview from Bob Gale PremiumHollywood.com did back in 2010 to promote the 25th Anniversary DVD and Blu-Ray release. He mentions that Jeff Goldblum would have been a heavy favorite if Christopher Lloyd was not available. There have also been rumors that John Lithgow was in the running for the role of Doc Brown, but according to Gale, any such discussions didn’t get very far. Fact #2: Some of the technology predictions seen in the movie’s 2015 have come to life. However, the film did correctly predict a number of technological and sociological changes including: the rise of ubiquitous cameras; unmanned drones for mundane tasks; flat panel, widescreen television sets mounted on walls with multiple channel viewing; video chat systems; hands-free video game systems; wearable technology; and head-mounted displays. Although payment by thumbprint is not widely used, fingerprint scanning is in use as security at places such as airports and schools, where it is also used to authorize payments for meals. Cars and other vehicles have been able to be run using fuel generated from food wastes, though not through a fusion reactor as suggested in the film. Some of examples would be The Xbox Kinect, Apple Pay, Google Glass and the thumb print scanner on the Iphone. While we can joke about there not being flying cars and hoverboards, the movie was spot on in several other areas. Fact #3: The role of Clara Clayton was written with Mary Steenburgen with mind and Chris Lloyd had his first on screen kiss with her. The role of Clara Clayton was written with Mary Steenburgen in mind. When she received the script, however, she was reluctant to commit to the film until her kids, who loved the original, hounded her. Lloyd shared his first on-screen kiss with Steenburgen in Part III. Here are a few quotes from Mary Steenburgen about her part in the third movie from the official website. “I loved being the new kid on the block,” says Mary Steenburgen of becoming a member of the “Back to the Future” family. I hope everyone has a great Back To The Future day. And remember, playing video games with your hands is super lame, and someone calling you a chicken is always a reason to go. Coming once I get done withlunch.